Abstract: The ATI RX330 doesn't boast any new innovations. In fact, on paper its feature set is identical to the ATI IGP 300 and 350 chipsets. It was a great tactical move for nVIDIA to branch out into the chipset market, and the companies success story continues to develop in that field. Today, ATi is seriously trying to break into the chipset market for itself, perhaps sensing that if it doesn't it will soon be relegated to seriously diminished market share. Only time will tell if ATI's core logic becomes as successful as the nForce. The first ATI chipset, the Radeon IGP 300 was actually a pretty good "first try." The IGP300 was slower than comparative chipsets, had some memory compatibility deficiencies, but with a low price point offered users an interesting alternative for budget systems. The new ATI RX330 chipset looks to be full of potential, its memory compatibility is even being validated by the company. Currently Gigabyte has exclusive manufacturing rights to this chipset, so if you want an ATi Radeon RX330 based motherboard, the only vendor that can currently supply it is Gigabyte. The ATI RX330 doesn't boast any new innovations. In fact, on paper its feature set is identical to the ATI IGP 300 and 350 chipsets. We'll see if ATI has made any improvements under the hood. 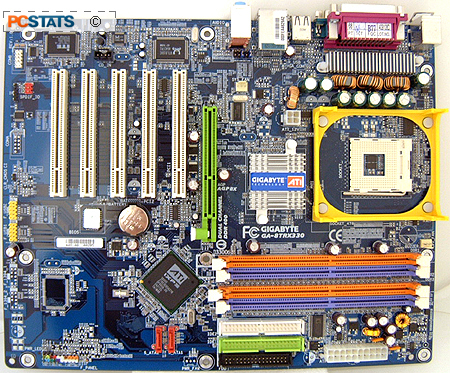 The Gigabyte GA-8TRX330-L is really a no frills Socket 478 Pentium 4 motherboard. It supports 800MHz FSB Pentium 4 processors with a maximum of 4GB of dual-channel DDR memory, and uses a standard AGP 8X video slot. The motherboard features an onboard 5.1 audio codec and a Realtek Gigabit Ethernet network adaptor, but nothing much else. If you do find the need to upgrade, be it for a TV tuner, IEEE 1394 card, or for RAID functionality, there are five open 32bit PCI slots. Four USB 2.0 ports round out the external connectors while a standard complement of two SATA connectors provide compatibility for newer hard disks. The GA-8TRX330-L is a full-sized ATX motherboard, and the layout is very user friendly. It was refreshing to see a compact Northbridge heatsink on the RX330 chipset. 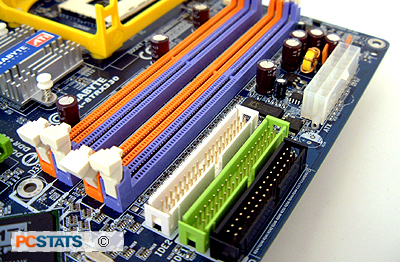 This motherboard does not generate a lot of heat, so it should be great for all sorts of applications where lower noise is important. Why can't all motherboard manufacturers place the IDE/Floppy and main ATX power connectors to the right of the DIMM slots? It's the absolute best location, completely out of the way of the other system devices! About the only thing I have to complain about with the layout of the GA-8TRX330-L is the proximity of the 8x AGP slot to the DIMM slots. If you're using even a medium length videocard you'll have to remove it before accessing the memory. Gigabyte has a great reputation for making things easy to understand with their products, and their Hardware Installation Guidebook for the GA-8TRX330-L is a fine example. It's extremely detailed and excellent for novice users. Most people might overlook software when buying a motherboard, but it can be an important accessory. The GA-8TRX330-L bundles in a full version of Norton Internet Security 2004, and in this day and age such protective measures are crucial. If you were to buy Norton's software separately, it would retail for $100 CDN. Not too shabby, and it'll certainly help in keeping your computer safe from viruses and potential hackers.